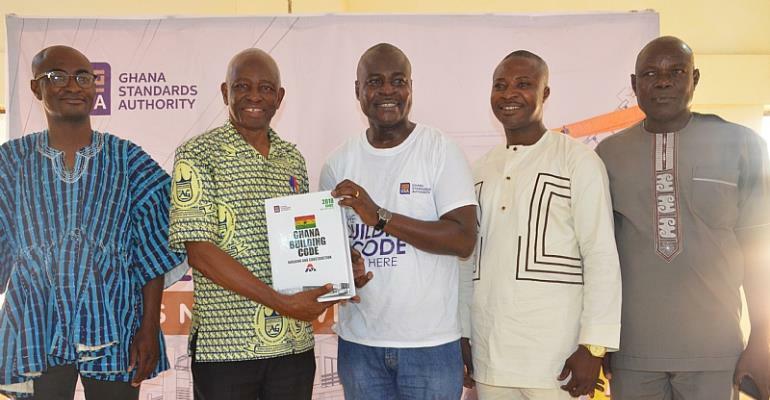 The Ghana Standards Authority (GSA) on Monday kick-started distribution of the first comprehensive Ghana Building Code (GS 1207: 2018) to Metropolitan, Municipal and District Assemblies (MMDAs) across the country. The exercise is to ensure the widespread adoption and use of the 38-part Code which was launched by the Vice President Dr. Mahamudu Bawumia in October last year. The Code is a set of rules that specify the standards for constructed objects such as buildings and non-building structures. The Director-General of the GSA, Professor Alex Dodoo presented the first copies of the document to all the Municipal and District Assemblies in the Upper East Region at a short ceremony held at the Navrongo Campus of the University of Development Studies (UDS). Professor Dodoo said the Code will guide the building and construction industry in Ghana and encouraged the District Assemblies to ensure that all building materials met international standards in order to ensure adequate protection, public health and safety. The Municipal Chief Executive of the Bolga East District Assembly Professor Emmanuel Abole, who received the copies of the Code on behalf of all MMDCEs in the region, thanked the GSA and its partners for producing the Building Code which he said had come at the right time to regulate the construction sector. He wondered why buildings constructed during the colonial era were still standing while those put up recently were collapsing adding that the coming into force of the Building Code should end the era of mediocrity to ensure that Ghanaians had value for money. “We need the best for our country and I believe that we will get it,” Prof. Abole said while assuring that the various assemblies will use the document as guide in their daily work. The document was modified from existing International Building Code and lays down the essential requirements for building and structural conformity. Ghana has been operating without a comprehensive building code since independence. Essentially, it has been a free for all in the building and construction industry with no clearly defined standards. The Code was developed by the GSA on behalf of the Ministry of Works and Housing (MWH), with the support of the Swiss Government, through the Ghana Office of the International Finance Corporation/World Bank Group (IFC/WBG). Professional associations such as the Building and Land Research Institute (BLRI), Ghana Institution of Engineers (GhIE) and Ghana Institute of Architects (GIA), contributed to the development of the 1,700-page Building Code.